Remembering the past is not always easy. In 2008, when our organization moved to a small, mostly segregated neighborhood, we wanted to chronicle the history of this family-oriented community where people were literally related to one another or they considered their neighbors ‘family’ because of their proximity and shared experiences. In tracing Hopewell’s history from the early 1900s, the experiences shared included employment at the government plant that manufactured gunpowder for the forces fighting in World War I, membership in a church that started and grew with the community, a lifetime commitment to DuPont, a company that employed a majority of Hopewell’s men, living and working through the Jim Crow era when places of entertainment, religion and commerce were clearly marked with discriminatory signage, watching the Civil Rights movement come to their hometown and garner national attention, hearing that integration was the law of the land while still sending their children to segregated schools and living in an all black neighborhood. It is this story that we are trying to capture and preserve. The work has been tedious, frustrating at times, and immensely rewarding. There are obvious difficulties in trying to write a history that is not yours. We began with finding the storytellers, determining family connections, researching historical documentation, and collecting photographs. Beyond the objective elements, researching a history necessitates separating fact from fiction, discerning implied meanings, understanding cultural particularities, and picking up on clues that reveal more of the story. All of this is involved in writing a people’s history. The building that once served this community as an elementary school, the building that our organization is working out of, now has an exhibit wall dedicated to the story of Hopewell. As our neighbors and visitors stop by to the exhibit, we look back on the process of researching Hopewell’s history. Finding our primary source took only as long as it takes to ask: “Do you know someone who can tell me about the old days in Hopewell?” We were immediately directed to Mary Lindsley, “the Hopewell Historian.” Mrs. Lindsley had written a history entitled, “History of the Hopewell Community As Remembered by Mother Mary Elizabeth Lindsey.” The History consisted of five paragraphs nearly filling a single sheet of paper. Needless to say, it was brief but it was a start. Mrs. Lindsley will turn 92 this year but her memory rivals many who are much younger. She can remember where her mother shopped, what books she read in elementary school, the names of all of her teachers, when electricity came to the neighborhood, and the jobs of the men and women in Hopewell—whether tenant farmers, Dupont factory workers, or maids in the homes of white folks. She remembers and she wants to share those memories. Although she had a wealth of stories, what Mrs. Lindsley did not have were photographs. Over the years, she said, many of the photographs she had were lost or destroyed. She also remarked, “People back then didn’t have cameras to take pictures.” Our search for photographs extended from asking neighbors to scouring the archives of the library. After several years, we collected just enough pictures to visually tell the story. 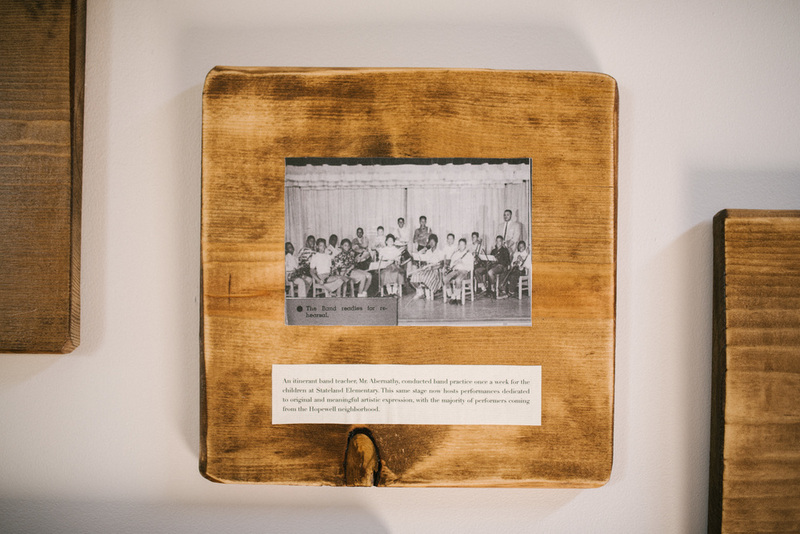 With the completion of the exhibit, our neighbors in Hopewell will be able to visit their ‘old school’ and see a snapshot of their history prominently displayed in the foyer. And together, young and old, they will remember the stories recounted through the years--stories of good times, periods of tremendous hardship, and the days when injustice was called equality. Though the Hopewell History wall was a group effort carried about by several members of our organization, Rosemary Sherrod primarily led the effort through conducting dozens of hours of research, interviews and conversations. Rosemary directs our organization's Social Services sphere, which provides care for the widowed, elderly and at-risk youth of the Hopewell neighborhood.